Ramadan recipes or iftar recipes that can be prepared in advance and refrigerated for few weeks is a great thing for most of us. So let's concentrate on prayers by trying such make ahead drinks and snacks for this Ramadan. Moreover, it is not at all an easy task for a Muslim woman to prepare delicious food for her and her family, fasting the long hours. So here am with an easy healthy drink which is ideal for suhoor or iftar. 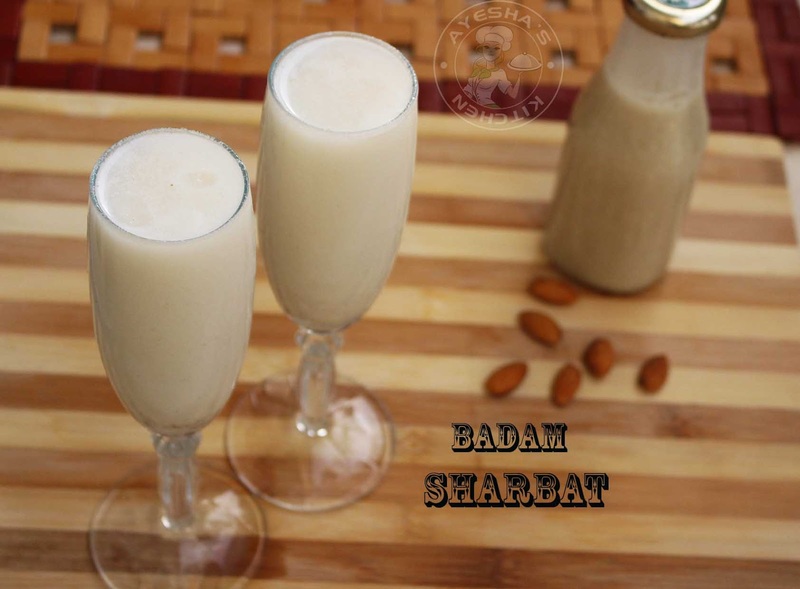 Prepare badam syrup or almond syrup and store in the refrigerator for making instant tasty drinks. Homemade badam syrup is very easy to make ahead Ramadan recipe. 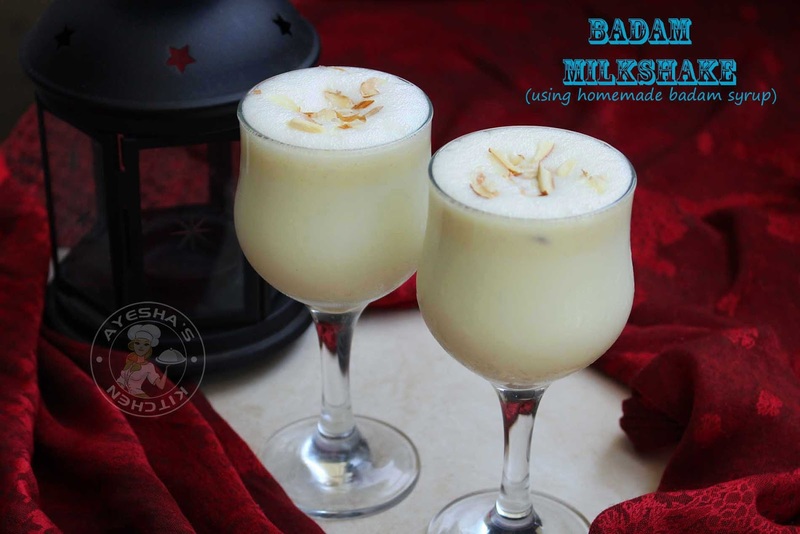 You can prepare badam milk, badam sharbat, badam milkshake and lots of drinks with this syrup. 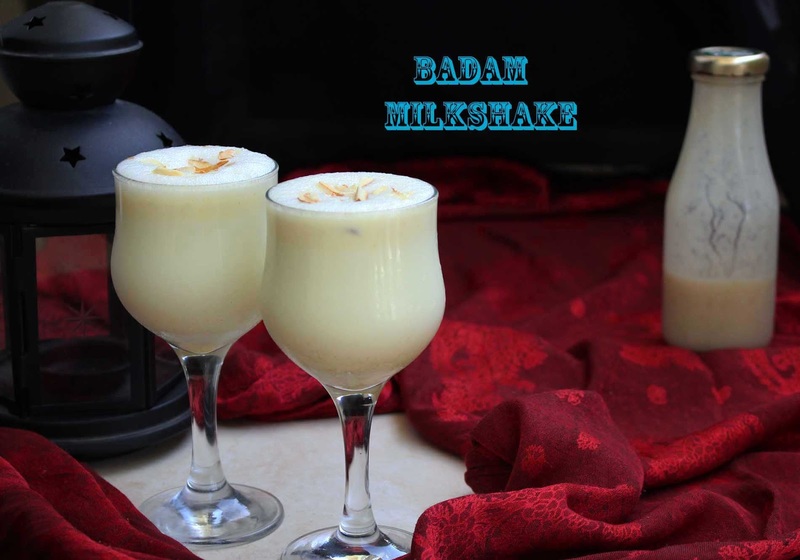 Do prepare this badam syrup at home and make badam milkshake within a minute for your guests. Do you know that badam or almonds have a plenty of health benefits? Do you know that soaking almonds in water helps in easy digestion? Do you know that almonds reduce hunger and promote weight loss? Yes, it is. So this drink is very perfect for suhoor or for iftar. 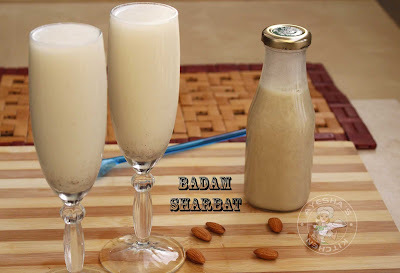 You can prepare this syrup with half kg or 1 kg of almonds and store the prepared almond syrup in the refrigerator for making these tasty healthy instant drinks throughout the holy month. Here is the recipe showing how to make homemade badam syrup/badam milkshake/ badam sharbat /badam milk/ Instant drinks for Ramadan/ iftar drinks/ almond drinks/ quick drinks for iftar/ healthy milkshakes. For making badam syrup, soak the almonds at least for 8 hours. So that we can discard its skin easily and grind it to a fine paste. After soaking peel its skin and grind the almonds in a grinder along with cardamom powder or crushed cardamom and water (required for grinding it ). Grind it until a smooth and fine paste (very important). Set aside. Now add sugar and water in a heavy deep bottomed pan. Mix well to combine. Cook until sugar is melted well and syrup turns thick over a very low flame (important). When done, add the almond paste to it (add quarter a cup of water in the grinder, swirl it and pour that water too). Let it cook well over a low flame until the mixture starts boiling. Once boiled, stir continuously for 2 minutes and remove from flame. The almond paste must be well combined with the sugar syrup. When done, pass it through a strainer and transfer it to a bowl. Let it set aside to cool. Once cooled, do not mix now, transfer this syrup to a bottle. Keep it in the refrigerator. You can make badam sharbat and badam milkshake instantly within a minute. The shelf life of this syrup when refrigerated is 2 weeks or more. Add all these ingredients into a blender except sliced almonds and blend well. Mix all these ingredients in a bowl and serve cool. You can add more badam syrup if required. Moreover can add lemon juice and kuskus also.